For those not in the know, Clutch is an American rock band based out of Frederick, Maryland; officially originating in Germantown, Maryland, to be precise. They met while in high school in Germantown and consider themselves a Frederick-based band where they write/rehearse for every album/tour. The band formed in 1991 and since its formation, the band line-up has included Neil Fallon (vocals, rhythm guitar, keyboards), Tim Sult (lead guitar, backing vocals), Dan Maines (bass, backing vocals) and Jean-Paul Gaster (drums and percussion). 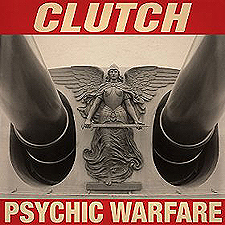 To date, Clutch has released ten studio albums, and several rarities and live albums. In fact, as of 2008, the band have been signed to their very own record label, Weathermaker. Their eleventh just-released new studio album is entitled Psychic Warfare and is, without a shadow of a doubt, a full blown, head on, straight to the head, heart and soul musical venture, for sure. Working again with acclaimed producer Machine, this time in Texas, the concise arrangements that made Earth Rocker so assertive is the same harness for the combustible musical energy on Psychic Warfare. Harder, faster, and yet seemingly more controlled, more contained (for the most part), the album has to be heard to be believed. From the moment the brief instrumental introduction, "The Affidavit" subsides, and the first real track, "X-Ray Visions" is upon us, you better have your ears ready for the incredible, simply pulsating speeding train musical avalanche that it about to completely overhaul your day for 12 tracks! Psychic Warfare is non-stop intensity of the highest level, quite literally, and is made whole by the group of guys at its helm. With their core rhythm section inclusive of drummer Jean-Paul Gaster and bassist Dan Maines, it's balanced out perfectly by guitarist Tim Sult and vocalist (and guitarist/harmonica playing) Neil Fallon. This tight, excitingly exhilarating new album continues onward with tracks such as the powerful "A Quick Death in Texas", "Your Love is Incarceration", and the titanic album closer, "Son Of Virginia", but one of my personal favorites on the album is "Noble Savage." It's a track that contains elements of various musical genres, and yet primarily ebbs and flows good, old fashioned rock 'n' roll. It's been said that Psychic Warfare is "a soundtrack to the plot of singer Neil Fallon's imagination," and if that is true, well, man, that guy has something inside him that needs expressing visually let alone audibly! Clutch consciously make each album conspicuously different from the last one, and this new one is no exception to that brave rule. Playing out in much the same way an episodic lyrical landscape populated by abstract characterization, nuance, and clever peculiarity would thrive contentedly, Psychic Warfare is an album for the here and now. So, right here, right now, go buy it!